My first bake on the first day of the new year ! 2017 ! 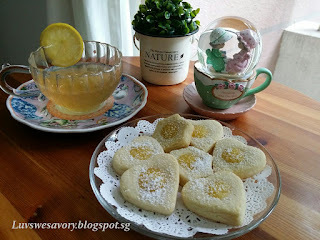 Citrusy tangy flavour lemon curd cookies ! 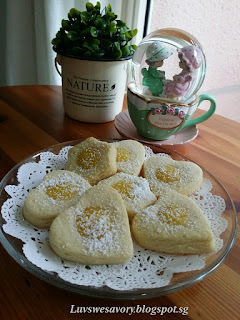 I've made some lemon curd last night and was thinking to bake some cookies with it. 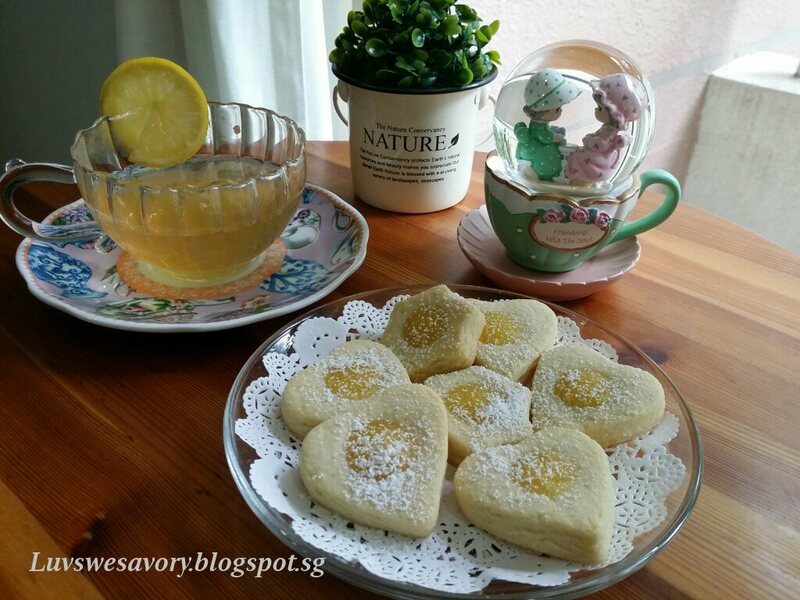 So ... here it is ... a batch of citrus tangy sweet cookies to kick start the first day of the year. Prepare the lemon curd in advance. Below my adjustment made - scale down to 2/3 recipe. Combine the ingredients (A) into a heatproof/stainless bowl. Half-fill a cooking pot with water and bring to a simmer. Set the heatproof bowl in the mouth of the pot and cook with low flame. Whisk the mixture until blended. Cook, stirring constantly (to prevent it from curdling), until the mixture becomes thick (like sour cream or a hollandaise sauce). This will take about 8 -10 minutes. Remove from heat and immediately pour through a fine strainer to remove any lumps. Whisk butter into the mixture until the butter has melted. Add the lemon zest and let cool. The lemon curd will continue to thicken as it cools. Cover immediately (so a skin doesn't form) and refrigerate for up to a week. Below my slightly adjusted version. 1) Sift the flour together with salt in a clean bowl, set aside. 2) In a mixing bowl, combine caster sugar and butter; beat until creamy with electric mixer. Add the egg and lemon zest and beat well. 4) Preheat oven to 180°C and position the rack in center of oven. (the oven temperature may vary, do adjust accordingly). 5) Line two baking sheets with parchment paper. (do not need to grease). 6) Prepare 2 tablespoons of flour in a small bowl for dipping of cookie cutter and the tip of small wooden roller. 7) Take the dough out from the fridge. Flatten it slightly to about 5mm thickness. 8) Dip the cookie cutter lightly with flour when necessary. 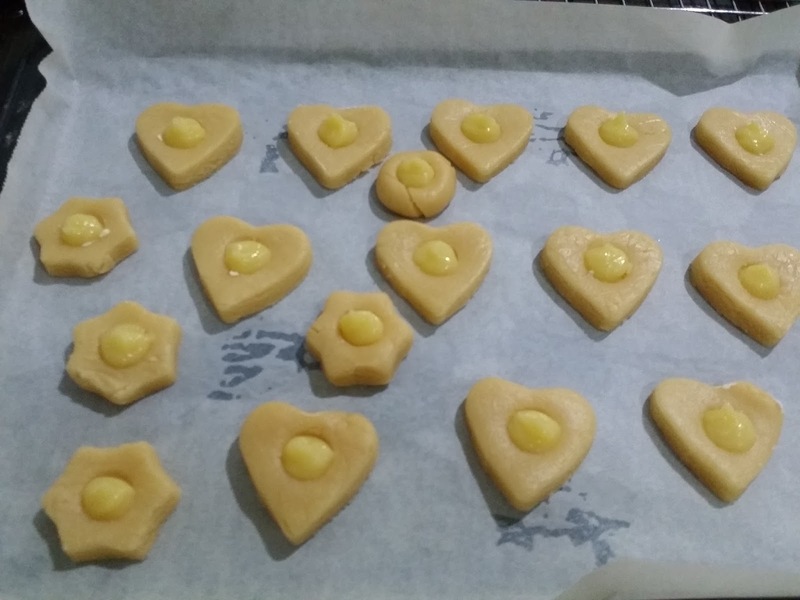 Cut the dough with cookie cutter and spacing them about 1/2 inch apart onto the prepared lined baking sheet. Use a measuring spoon or tip of small roller (or your floured finger) to press lightly to make indentation in center for the lemon curd. 9) Fill the lemon curd in piping bag and pipe a dollop of lemon curd onto each dent. 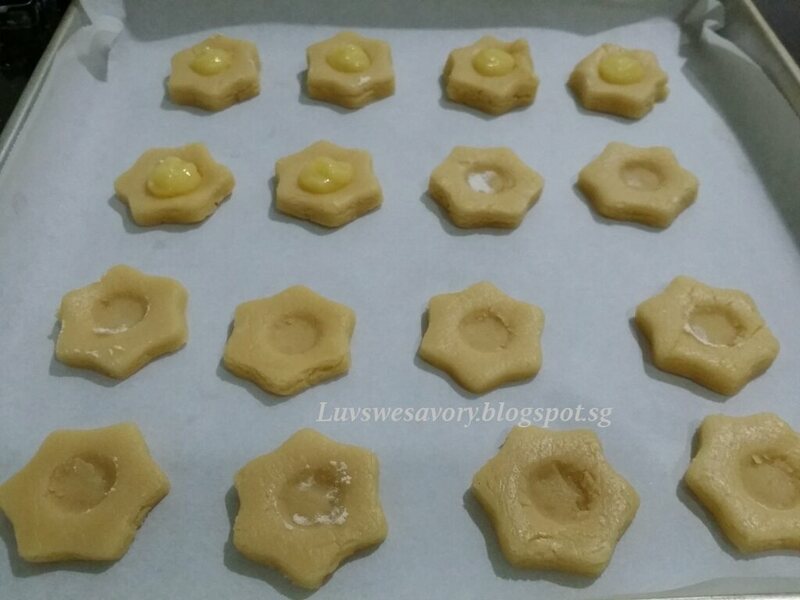 10) Bake in a preheated oven at 180°C for 10-13 minutes or until the bottom of the cookies are nicely browned. 11) Once baked, transfer onto a wire rack to cool completely before storing them in an airtight container. To serve, simply have them as they are or dust with some icing sugar if you like. Here, we are enjoying our LEMONY DAY with lovely baked yummy tangy lemon curd cookies and a cup of honey lemon tea ! Wishing all a Blessed New Year 2017! I love lemond curd (and about time I make it again! ), and the various designs for the biscuits you baked! Wow! gorgeous first bake of the new year. So summery, I love it! When talk about lemon curd, my mouth will full of saliva. 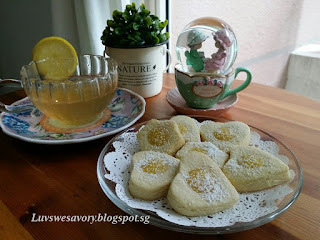 I wish can have a bite of this citrusy tangy flavour lemon curd cookies ! Thanks for sharing, Karen...Happy New Year!!! 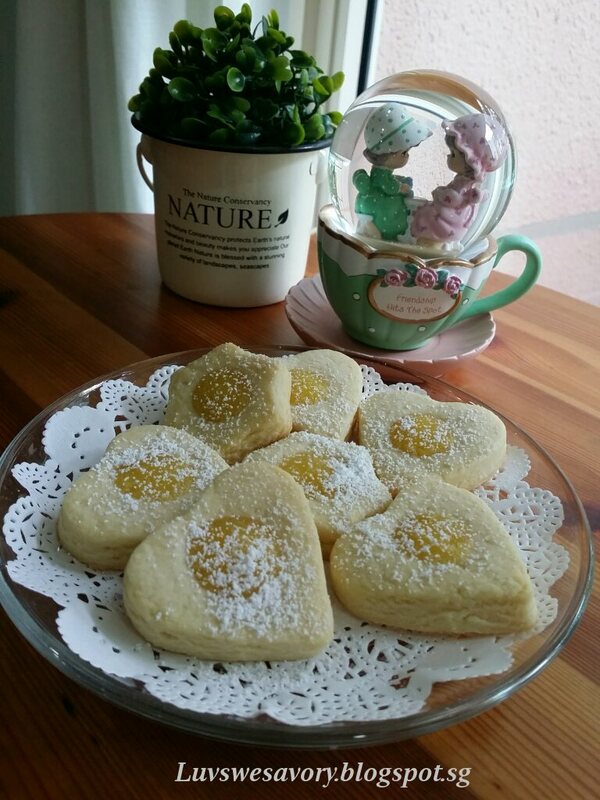 These cookies are a wonderful treat to start a delicious year! Hi Karen, my lemon tree is bursting with fruit right now I should make these, they look amazing! Karen, these look fabulous! If we lived nearby, I will be a frequent visitor. Wishing you a fantastic 2017 with many magical adventures and lots of love.